Well,here we are in the Caribbean after a good Atlantic crossing. It took us 24 days, around three more than we had hoped for, as the trade winds didn't establish themselves until we were almost here. We tracked much further south to near the Cape Verde Islands before heading out westwards to keep favourable, if somewhat light winds. The 6000 mile journey of the last five months has been about getting over the pond. Now we are here, the pace changes with no more hard deadlines to meet, other than getting south below 12°N by July to avoid the hurricanes. Re-capping, we left the Hamble river on Mon 5th July and crossed to Alderney in the Channel Islands. The next leg, a four day passage, took us across the Bay of Biscay direct to La Coruna on the northwest coast of Spain. There we began a leisurely cruise down the west of the Iberian peninsula, taking in the Rias of Galicia, Portuguese coast and Cadiz, arriving at Gibraltar on 13th September. We called in at Tarifa on our way out of the Med on the 600nM passage to the Madeiras. From there it was only 260nM to the Canaries where we visited Graciosa, Lanzarote, Lobos, Fuertaventura, Gran Canaria and Tenerife. We left Santa Cruz de Tenerife to head out across the pond on Sunday, 21st November. 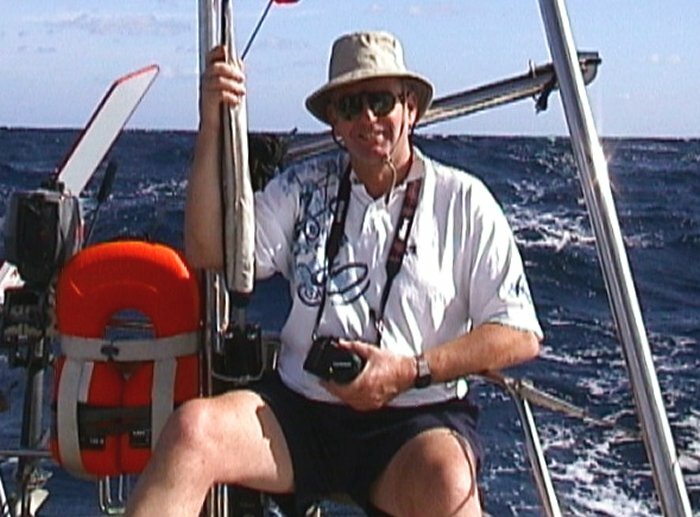 We were lucky to have our sailing friend Jim Gill with us for the crossing. He and wife, Liz had planned to be with us here for the festive season but Jim just couldn't resist the opportunity to do it the hard way. It certainly made life easier for us as watch keeping was less demanding, Di was spared the heavy grunting on the foredeck with poles etc and of course it was great to have company for the long hours of watching the waves go by. Pictured below he is doing just that. What were the memorable impressions of the voyage? Well, certainly the short days with daylight getting gradually later as we moved westwards but still with our clocks all registering GMT (UTC, Zulu). The warm tropical weather (Dave wore only underpants day and night for the whole crossing). The ever present sea life, mainly flying fish leaping out of the water as Amoenitas surged toward them and scooting off across the waves for sometimes as much as 100m before splashing down. Most mornings we 'weeded' the decks of the nights unintentional catch. Here's Jim holding up an unusually large specimen. We had fine displays from dolphins and several schools of whales passed close by. We saw only one cargo vessel but tens of yachts as this was the peak time to make the passage. Also, at last we perfected the art of blue water fishing. We had lost a lot of gear to big fish, so armed with 100lb stainless steel trace Dave set about perfecting the lure strategy. It took a 'bird', fashioned from the end of a beer can to emulate a flying fish near the surface and get the prey to take the rubber, octopus lure. Our 'fishing machine' proved so successful that Dave was only allowed a permit every four days or so as the crew tired of consuming the catch. We caught mostly dorado and wahoo, usually around 1m long which generate a fair number of steaks, typically more than enough for three meals for the three of us. Here are a couple of specimens. We relied for weather information on our weather Fax and two sources over the HF SSB radio. One was the Si-Oui Net. This is a group of yachts from Oz, NZ and of course we Brits, who share weather data, other useful info and keep a log of boat positions. It became invaluable when there was an emergency (more later). The other source was Herb (Hildenberg) who transmits weather and routing information to boats throughout the N Atlantic from Halifax, Nova Scotia. His knowledge and sources are legendary and every evening at around 22.00 UTC when he got to our region, we gathered around to hear those pearls of advice delivered in deep sonorous tones. What a legend he has become to we long distance sailors. There were a number of incidents we heard of on the crossing. Most amazing was the skipper of a small Norwegian boat who fell overboard. He was eventually spotted by a P3 maritime search aircraft after 18 hours in the water, just before dusk. Another yacht was vectored in to recover him. It was that boats second uninvited crew as they had already picked up a stowaway who had been thrown from a commercial vessel off the African coast! There was also a yacht discovered abandoned with liferaft deployed but we haven't heard the outcome of that, though there were reports of an EPIRB being activated and flares seen. The seas are typically 2.5-3m so it isn't possible to see a great distance from cockpit level. We had our own bit of drama when Dave used his Radio Amateur licence for the first time in anger in a medical emergency on Saturday, 11th Dec. About 800nM out, a guy we knew on a yacht around a 150nM north of us had a serious heart attack. We got involved through the Si-Oui net and Dave managed to raise HAMs in Barbados and Greenock, Scotland. They contacted the local West Indies coastguards and the MRCC (Maritime Rescue Co-ordination Centre) in Falmouth. A container vessel was diverted toward us. As Amoenitas was in a good position and were about the only ones with reasonable radio copy on all involved, we had to act as co-ordinator vectoring two yachts to do a transfer of a nurse, additional crew and medical supplies in mid ocean . After a report from the nurse and discussion with a doctor on another boat, we eventually decided against a transfer to the big ship due to the casualties condition. It all worked out OK and Mike got into St Lucia for treatment. He has now been transferred to Martinique as his condition is serious and they have better equipment there. It was pretty hectic on Amoenitas for over 36hrs, with continuous HF radio working. Dave reckons he will be lucky to avoid a dose of tinnitus. The extra crew member was really appreciated in these circumstances when there was far too much for two to do. 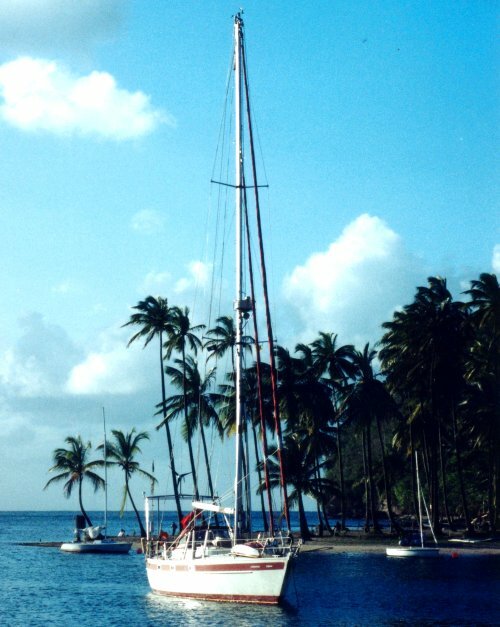 Once headed west, we sailed on a run with twin poles out much of the time, flying the cruising chute in lighter winds (until it split asunder with around 12kts over the deck). West of longitude 50°W we experienced localised strong winds, in squally conditions, as clouds formed from the warm seas around us. On a good day we averaged around 120 miles in the 24 hour, noon to noon run. Our best was the last day when we did over 160 in E/NE 22kt winds. The worst a miserable 80nM. Here's a view of Amoenitas, anchored in the tiny bay at Marigot on St Lucia with palm trees and mangroves all around us. We pick up Liz from the airport on Sunday 19th Dec and head south to Martinique, Bequia, Mustique and the Tobago Cays for the festive season. There Dave hopes to get Di back into Scuba diving and give Jim and Liz a chance to try it for the first time in ideal conditions. We get back to St Lucia for New Year and our guests leave on the 2nd Jan. We will probably spend a few more days in St Lucia before heading north to Martinique and the Leeward Islands. We are looking forward to seeing both sons, with girl friends pretty soon, probably somewhere around Antigua.